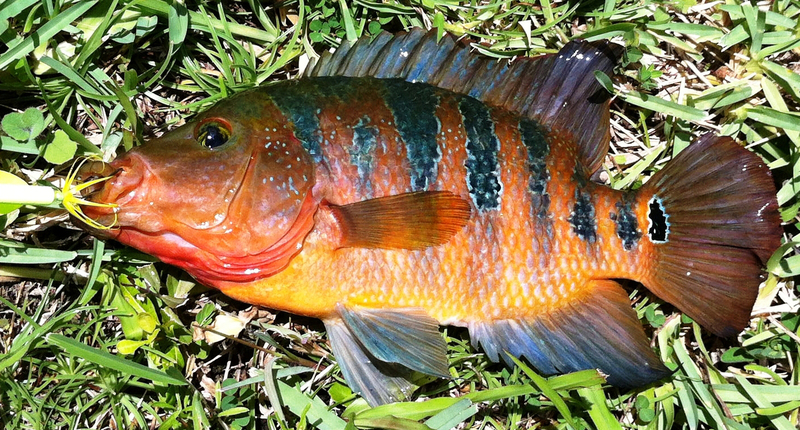 Mayan Cichlid, CIchlasoma uropthalmus, taken on lure in Florida waters. The species is now abundant in South Florida and is known for its meaty, white, mild-flavored meat. Known to some locals as the “Atomic Sunfish.” FWC image: John Cimbaro. The State Fish and Wildlife Commission today issued an invitation to fishermen to help reduce the burgeoning populations of non-native fishes in Florida waters. “Want the opportunity to win prizes while helping to document and remove nonnative freshwater fish from Florida’s waters? Consider participating in the second statewide Nonnative Fish Catch, Click and Report Contest, coordinated by the Florida Fish And Wildlife Conservation Commission (FWC) and partners. The 2016 contest kicks off at 6 a.m. on April 1 and runs until midnight on April 30. “Participating is easy — anglers simply take a photo, enter detailed catch location or GPS coordinates, and report nonnative freshwater fish catches to IveGot1.org during the contest sample period. Catches can also be reported by downloading the IveGot1 app, by calling 888-IVE-GOT1 (888-483-4681), or by posting photos and catch data to your Instagram account. The contest is part of a continuing effort to raise awareness of nonnative fish species and encourage anglers to target nonnative fish for consumption by the FWC and partners, including the U.S. Geological Survey, U.S. Fish and Wildlife Service, National Park Service, Florida Invasive Species Partnership, University of Georgia and Everglades Cooperative Invasive Species Management Area. Partners plan to hold the event annually with the help of anglers acting as citizen scientists. Hey could you send me a list of the non native fish ill be fiahing for? There’s a link at the bottom of the post. So who should we eradicate all peacock bass from Florida? They are a non-native species? I just caught a manatee. Does that count?